We make Hostess Skirts for women who desire a classic, refined look. A hostess skirt is an ankle length skirt with very shallow pleats in the back. 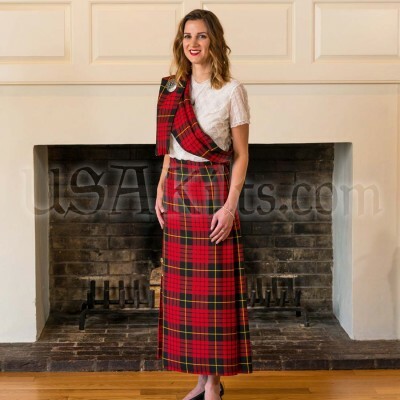 We have hundreds of tartans available, all shown in our tartan gallery and of course, all woven in the U.K.
Our Hostess Skirts close with velcro on the inside left hip and with 2 straps and buckles on the outside right hip. The edge of the front apron is tapered and fringed for that classic look. 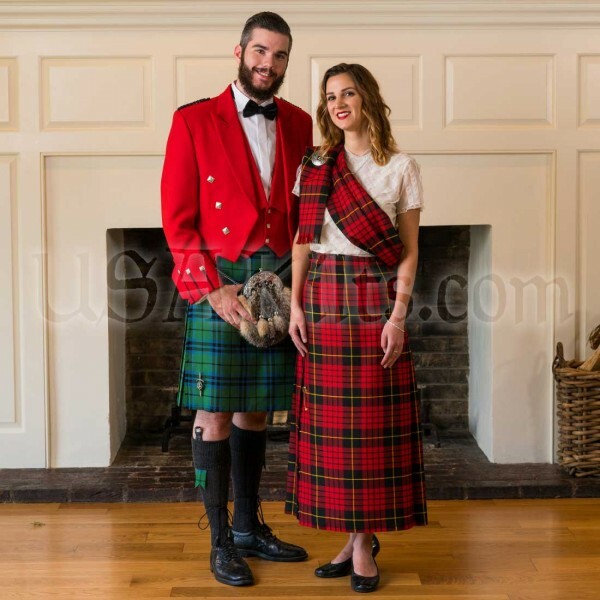 We would ask that you measure carefully for our kilted kilts. Since these are custom made to fit the measurements provided, you will need to be sure of the exact sizing. We will not refund in the case of mistakes in measuring. Detailed measuring instructions can be found in the "Measuring Instructions" tab below this text. 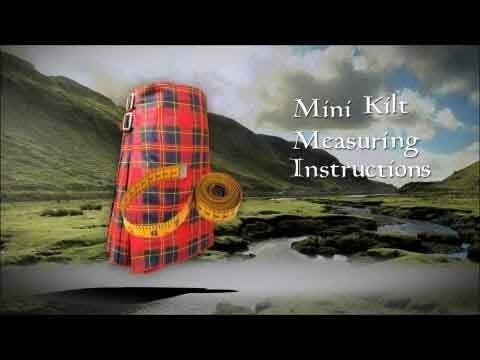 These skirts are custom made in Scotland and will take roughly 6 to 10 weeks to ship. 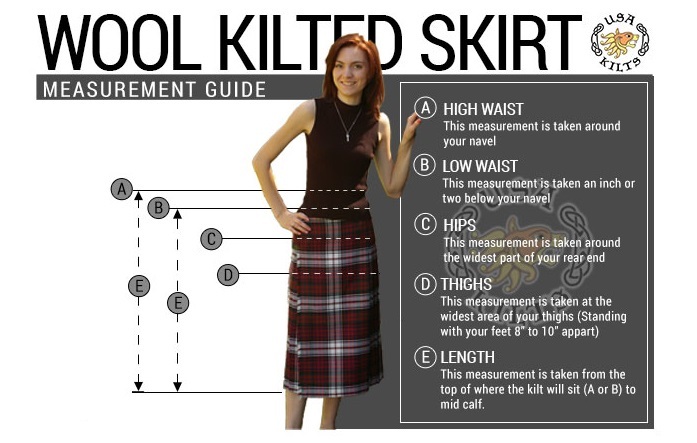 First, determine where you would like the top of the kilted skirt to sit. It can be worn either at the "high waist" (around your naval... "A" in the diagram above) or "low waist" (where you wear your jeans... "B" in the diagram above). If you want to wear it at the "high waist", measure around your belly button. If you want to wear it at your "low waist" (at the height you wear your jeans), measure at that level. Please pick one or the other. That will be where the top of your kilted skirt will sit. This measurement is taken around the very widest part of your rear end. This measurement should be taken a bit loosely. Standing with feet about 8" to 10" apart, measure around the widest area of your thighs. Measure around both thighs, not individually. 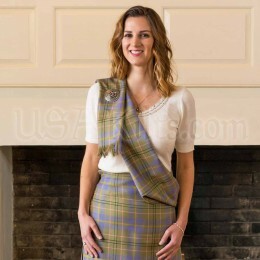 This is measured down the side of your body from the top of where the kilt will sit (i.e. at the height where you measured your waist) straight down to about mid calf. The preferred length is VERY subjective and can be anywhere from 2 or 3 inches below the knee to almost ankle length.